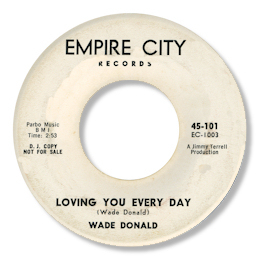 As far as I’m aware New York artist Wade Donald only had the two 45s released – but both of them are absolutely essential. 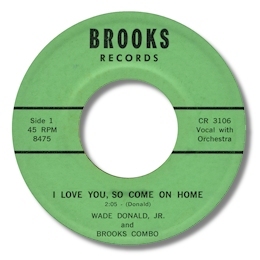 His first for the tiny Brooks label You Know How I Feel has some doo-wop elements to it especially in the chord changes but Donald’s wholly committed vocal is full of gospel fire. You couldn’t really call this anything but the deepest of soul. No wonder that interesting character Jack Taylor picked it up for his Rojac label. Donald’s second 45 may just be even better. Like Charlie Ford’s superb 45 for Jimmy Terrell's Empire City Loving You Every Day is simply outstanding. Check out Donald’s screaming performance here for a masterclass in the heaviest of soul singing. Great plodding rhythm section led by a fine pianist too, and if you add a female chorus and the gritty horn section you have a perfect deep soul ballad. 10 stars - even on the garish blue vinyl. Thanks to Mike Atherton for the suggestion.